PER MOTIVI ORGANIZZATIVI E’ OBBLIGATORIA L’ADESIONE (TEL. : 059/677539 – 335/6448625) L’EVENTO E’ COMPLETAMENTE GRATUITO. 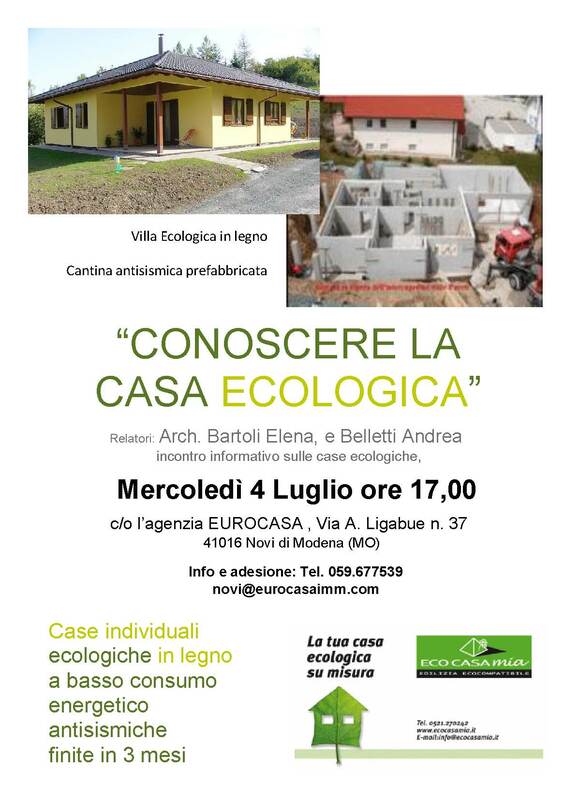 I NOSTRI UFFICI HANNO DA TEMPO INSTAURATO DELLE COLLABORAZIONI, E NE STANNO INSTAURANDO DELLE NUOVE, CON PRIMARIE DITTE COSTRUTTRICI DI CASE IN LEGNO IN BIOEDILIZIA E ANTISISMICHE DA COSTRUIRE SU ALCUNI LOTTI EDIFICABILI CHE DISPONIAMO NELLE ZONE DI ROLO, NOVI, FABBRICO, MOGLIA, CARPI. I TEMPI DI COSTRUZIONE SONO BREVI E CERTI, I PREVENTIVI INVARIABILI E SOPRATUTTO RISPONDONO AI CRITERI PIU’ ESIGENTI IN MATERIA DI ANTISISMICA. PRESSO I NOSTRI UFFICI POTRETE TROVARE TUTTE LE SPIEGAZIONI COMMERCIALI E TECNICHE.